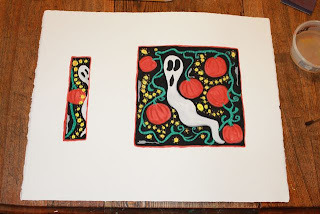 Last night, my oldest daughter and I painted together. I worked on a painting of a narwhal in the ocean and she finished up one painting and created a few new pieces. One of her paintings caught my attention (see below). 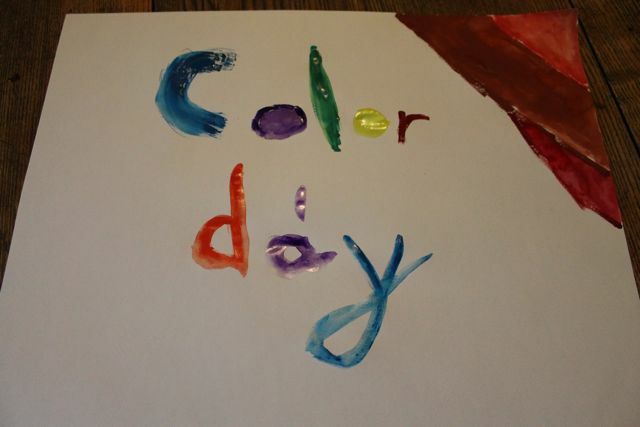 The words she painted, "Color day", triggered a question in my mind, "How is color important to my family each day?" This post contains links to Amazon.com. If you click on one, we will receive a small commission — at no additional cost to you — on anything you buy at Amazon for a certain length of time afterwards. I thought back over the past few days and I was surprised (and happy) that I could think of many instances when color was a big part of my interactions with my children. -- One morning, before the bus arrived, my son and I talked about the sky. He described what he saw, "Bright blue with no clouds at all." I think that would be a great new name for a Crayola crayon. -- Yesterday, I played I SPY with my youngest son while we walked around the neighborhood. I didn't want him to walk by the object before he had a chance to find it so I added color words to all the objects, "I spy a red truck. I spy a blue mailbox. I spy a yellow flower." The color words made the objects easy to pick out. Today, he used the same technique when he challenged me to find the objects. -- We have been playing with the Lego Duplo blocks all week. Our living room floor has been covered with colors, and tonight my oldest daughter constructed a column of blocks with the colors of the rainbow in order - ROYGBIV (Well, actually she left out the indigo, we didn't have that color!). -- I noticed that I have started adding color words when I talk to my 17 month daughter. It is no longer a "bunny" in the yard, but a "brown bunny" and it is no longer a "bird" on the feeder, but a "red bird". 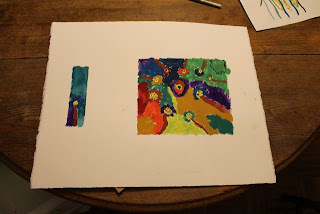 -- We had a family painting night after dinner one night this week. I love listening to my children mix different colors of paint. My youngest son always says, "What does ____ and ____ make?" I always respond, "I don't know. Why don't you try?" I love his excitement when he tells me what color he made. My favorite was when he said, "What does brown and black make?" I replied, "I don't know why don't you try?" He said while mixing, "Probably yellow.....nope it makes black." -- Every night before bed we read picture books. 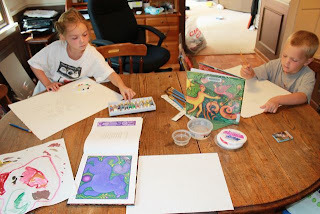 One night this week we read, Summer Birds: The Butterflies of Maria Merian, written by Margarita Engle, and my children and I enjoyed examining all the colorful illustrations of butterflies and caterpillars. My oldest son was making comparisons between caterpillars on one page to the butterflies on another trying to find similarities in their patterns. 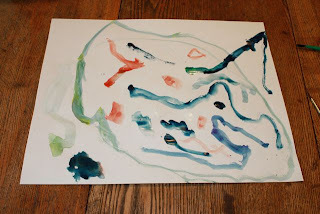 (Click here to see a blog she did that has my favorite illustration from the book). 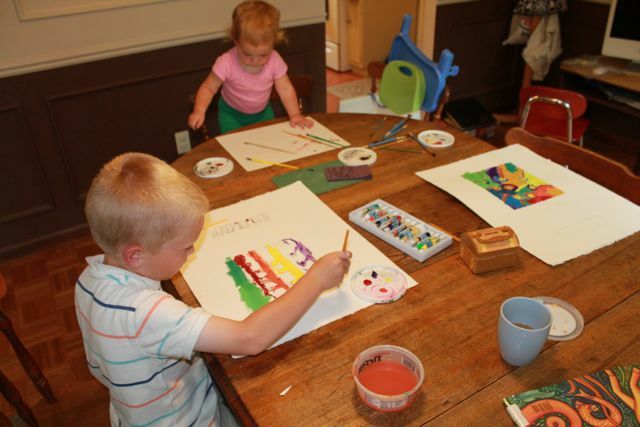 It seems that color is certainly an important element of each day for my children. They seem to be naturally drawn to colors.They can't help but pay attention to them and talk about them. 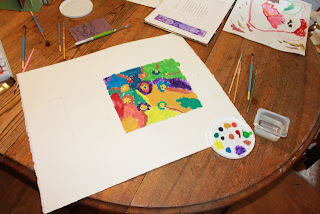 My colorful kids were in for a special treat this week when we read the bold, bright, and lively picture books illustrated by Julie Paschkis. 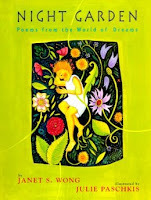 Julie Paschkis has written and/or illustrated thirty books including Night Garden: Poems from the World of Dreams by Janet Wong, a New York Times Best Illustrated Book and Glass Slipper, Gold Sandal: A Worldwide Cinderella by Paul Fleischman, a Kirkus Best Book for 2007. In the early 1990s, Julie Paschkis took an illustration class from children's book author-illustrator, Keith Baker. "At the end of class I went to New York with my portfolio and dummies -- one of which became So Sleepy/So Awake (Her first book in 1993). I quit my teaching job and I've been painting and illustrating full time since then." (Seven Impossible Things). 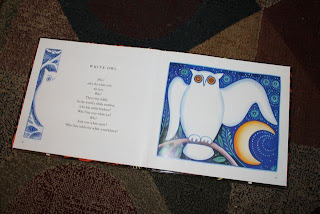 While I was waiting for my children to finish brushing their teeth before bed, I noticed in the copyright information of Yellow Elephant: A Bright Beastiary, poems by Julie Larios, that Julie Paschkis created the illustrations for the book in gouache on Arches paper. 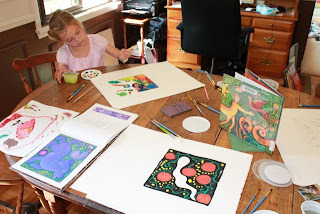 I had not heard of gouache, a type of opaque watercolor paint, until I started becoming interested in the art of children's picture books. I have always been intrigued by gouache (pronounced 'gwash') and thought it would be fun to try and paint with it. 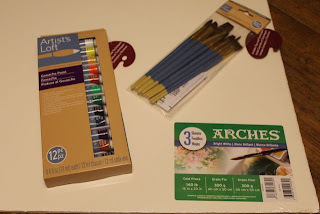 My family made a trip to Michael's to find all of our supplies for this birthday celebration activity. We were excited to shop for new art supplies and see that Halloween decorations are already available! I was so excited to find Arches paper. It is really thick and sturdy! I have always loved paper after spending many summers while in high school and college working in my father's print shop. 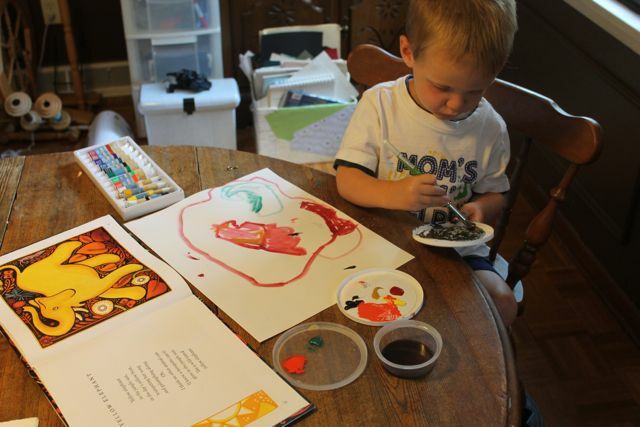 My youngest son and I were the first to break open the gouache paints. We read the poems in Yellow Elephant, talked about the illustrations, and then experimented with the gouache while the big kids were at school. 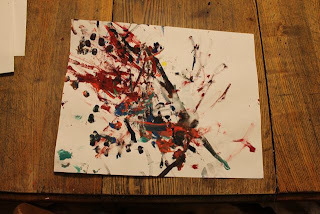 That evening my older two children wanted to experiment too! 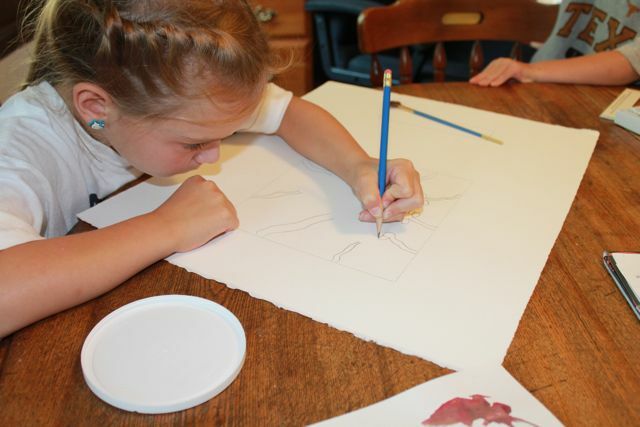 My daughter couldn't wait to work on the 16" x 20" sheet of Arches paper. We really liked how the illustrations in Yellow Elephant were presented with a larger painting on the right page and a skinny painting on the left next to the poem. We called the skinny painting a "bookmark painting." 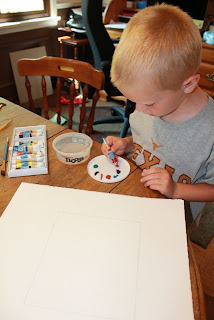 I measured the sizes of both of the paintings from the book and added the rectangles on the Arches paper in pencil to define our painting area. According to the video below Julie Paschkis almost always works at 100% scale when illustrating her books. My oldest son took care to prepare his paint palette on a plastic lid. We were excited to find out in the video below that Julie Paschkis uses plastic lids too! We decided to sketch in pencil first before we began painting. 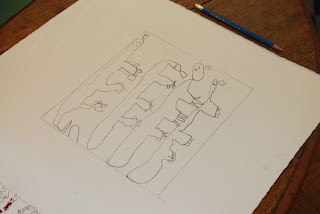 My son's design was of four Komodo Dragons. 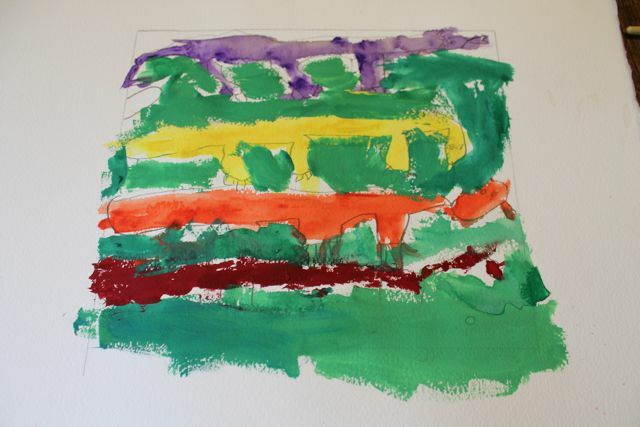 My daughter loved all the foliage she found in Julie Paschkis' artwork. She loved how it twirled and swirled. 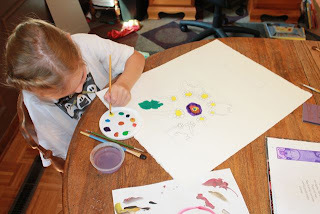 She was inspired to do a flower painting of her own. There was a lot going on in our dining room all week! 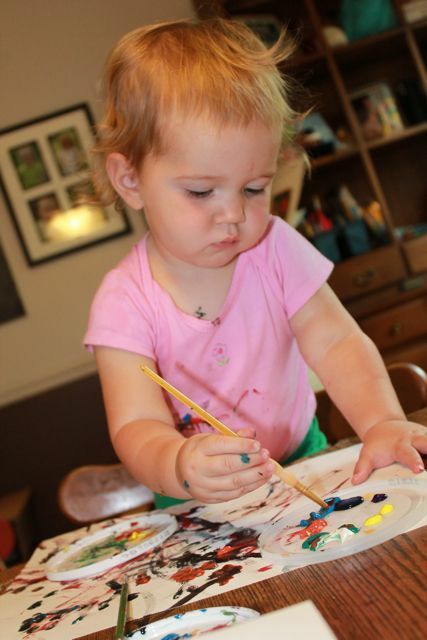 Her larger painting was just about complete at this point. She was so excited to completely fill in the background of her rectangle. My oldest son added color to his Komodo dragons. My youngest son absolutely loves preparing to paint. 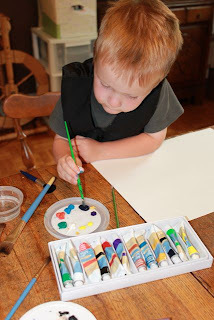 He carefully selects all the colors he wants to use. Then, he starts mixing! Sometimes he just mixed the colors on the lid and never actually painted. My youngest daughter was involved throughout the project too. Color is important to her as she likes to redesign her clothes! My favorite part of gouache is that cleans up pretty easily unlike acrylics. This is one of the many paintings that my youngest son made using gouache this week. My oldest son's Komodo Dragon painting in gouache. My oldest daughter's painting complete with the "bookmark painting"! She wants to add a poem at some point in between the two paintings just like the book. 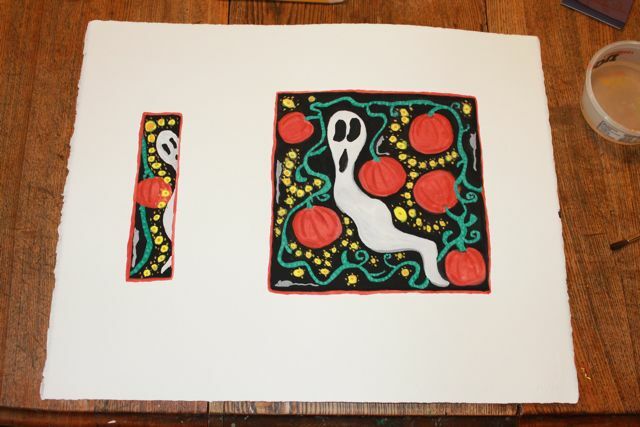 My first gouache painting too! Julie, my family hopes you have a wonderful birthday. It was a pleasure meeting you at the Mazza Museum this summer. Thank you for sharing your birthday with us! I almost forgot to mention that when Julie was signing a copy of her book Building on Nature: The Life of Antoni Gaudi, written by Rachel Rodriguez, for my children she told me about her 4th birthday party. Her mother gave all the children at the party straws to blow bubbles in pots full of a mixture of water and dish soap! Julie Paschkis with James Dean, creator of Pete the Cat, at the Mazza Museum Summer Conference 2013.